Boom. The 2017-18 NBA regular season has come to a furious finish. The Minnesota Timberwolves beat out the Denver Nuggets in overtime to squeeze into the last playoff spot in the West, while the Philadelphia 76ers are red hot after rattling off 16 straight wins. And while I’m bummed that I wasn’t able to go a full season without hearing the Kardashians’ name (thanks Tristan Thompson), let’s take a look back at the terrific regular season. Here are my picks for Coach of the Year, Rookie of the Year, Moment of the Year and Most Valuable Player. 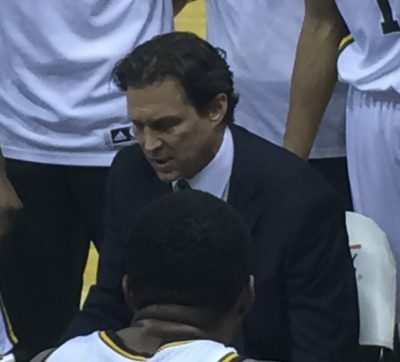 Quin Snyder doesn’t seem to be at the top of many lists. But while most are hoping Philadelphia’s Brett Brown, Toronto Raptors’ Dwane Casey or Boston Celtics’ Brad Stevens takes home the trophy, I’m sticking with Snyder. Snyder coached an All-Star-less team to a 48-34 record and the No. 5 seed in the Wild West just one year after losing Gordon Hayward. Great coaches can take mediocre rosters and transform them into playoff teams. He was also ego-less enough to let No. 13 pick rookie Donovan Mitchell take the reigns early and establish himself as the go-to guy for the Jazz. Not every coach is willing to do that. It’s not just me fighting for Snyder. Former Los Angeles Lakers great, Kobe Bryant, told ESPN’s “Detail” that he also thinks Snyder deserves to win it. This was the toughest decision for me. I’ve been flip-flopping on this one every day for the past week. Do I pick the miraculous Ben Simmons, who averaged a near triple-double (15.8 points, 8.2 assists and 8.1 rebounds) in helping his 76ers land the No. 3 seed? Although it was tempting, I’ve decided to go with Utah’s Mitchell. Mitchell led the Jazz to the No. 5 seed in the Western Conference. With 20.5 points, 3.7 assists and 3.7 rebounds, Mitchell filled a massive role as the clear leader of an NBA team. The Spider’s stats may not be as elite as Simmons’ through year one, but Simmons was in a much more comfortable spot this season. Look, Simmons had an awesome year. But with Joel Embiid (22.9 points and 11 rebounds) right beside you, it’s a little easier to get things going offensively. Who’d Mitchell have to back him up? The next best scorer, Rodney Hood (good for 16.8 points per game), was traded away halfway through the season. In terms of who will probably have a better career, I’d take Simmons. As for the better rookie season, give me Mitchell any day of the week. Your typical 32-year-old, gray-haired math tutor doesn’t look quite like an NBA player. Well, he does now. Andre Ingram, who has bounced around the NBA’s Development League and the National Basketball League for over a decade, finally got his call up to the NBA in early April. After signing with the Lakers and making more than half of his entire G League annual salary in three days in the NBA, Ingram did not disappoint. Making his rookie debut in a nationally televised battle against the Houston Rockets, the Richmond, Virginia native grabbed 19 points and the hearts of basketball fans around the globe. Ingram’s story received praise via Twitter from fellow athletes like Chris Paul, Julius Peppers and Justin Turner. As pathetic as it may seem to some, I shed a couple tears watching Ingram scoring bucket after bucket. Growing up around Los Angeles, kids like myself have long dreamed about hitting big shots in front of the Staples Center crowd even just for one game. As a Lakers fan, I hope Ingram’s incredible story isn’t over with us just yet. For most of the season I had James Harden winning MVP. Heck, I even did a column on why he deserved it fair and square. But I have come to a new conclusion. Let me start by saying this: I don’t care that LeBron James is 33 years old and is in his 15th season. That doesn’t factor into my pick for MVP. I don’t give somebody extra points just because they’re old. Screw that. Regardless of age, James is still having one of the most impressive seasons in the history of the game. The four-time MVP finished with 18 triple-doubles this season, and put up 27.5 points, 9.1 assists and 8.6 rebounds per game — better than Harden in just about every category except points. Of course, it’s not all about stats. Harden led his team to the league’s best record, but he had some help along the way. Rocket’s point guard Chris Paul raked in 18.6 points and 7.9 assists each and every contest. Although in October I didn’t think Paul would have a big impact, it turned out he did. Meanwhile, James had to dig his team out of “Strugglesville.” Although “The Process” got the best of them and moved ahead in the standings at the last second, you’d be out of your mind to count out James and the Cavaliers during the playoffs. And on defense, let’s not forget that Harden is still just as useless as wearing a windbreaker out on Commonwealth Avenue. Trust me, LeBron-haters. I was you for many years. It doesn’t end well. Wow a sports writer from the east gets it right? Are you from Utah? Now peg Gobert as DPOY and you are now my favorite writer-Great job! !